Watermelon is an iconic symbol of summertime. When I learned it could be incorporated into a cake, I was super excited to get in the kitchen and bake it. 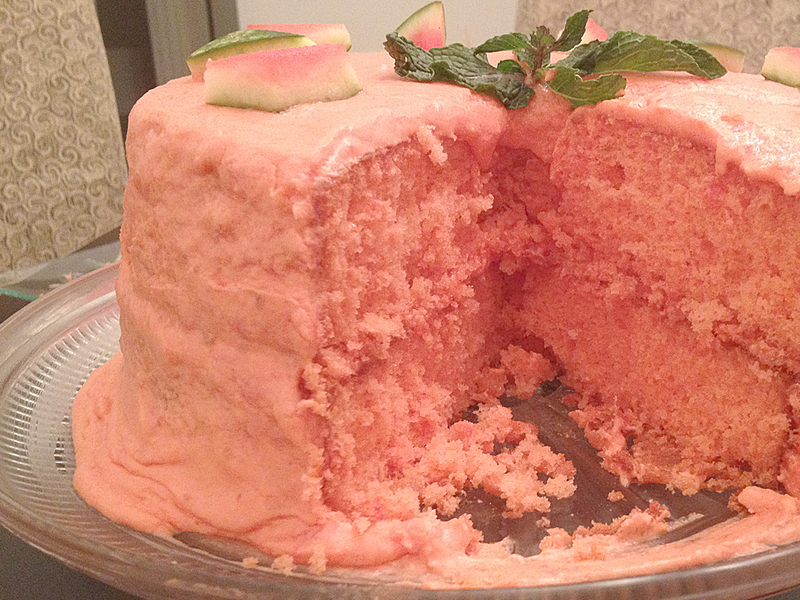 Pretty in pink and sweet as can be, this cake is bursting with watermelon flavor, light and airy, and comes together quickly. It all starts from a boxed white cake mix. Gather your ingredients and go to town! The recipe calls for a mixed-fruit-flavored gelatin, so I used strawberry-banana. I’m convinced it was the secret ingredient that really boosted the cake’s flavor. 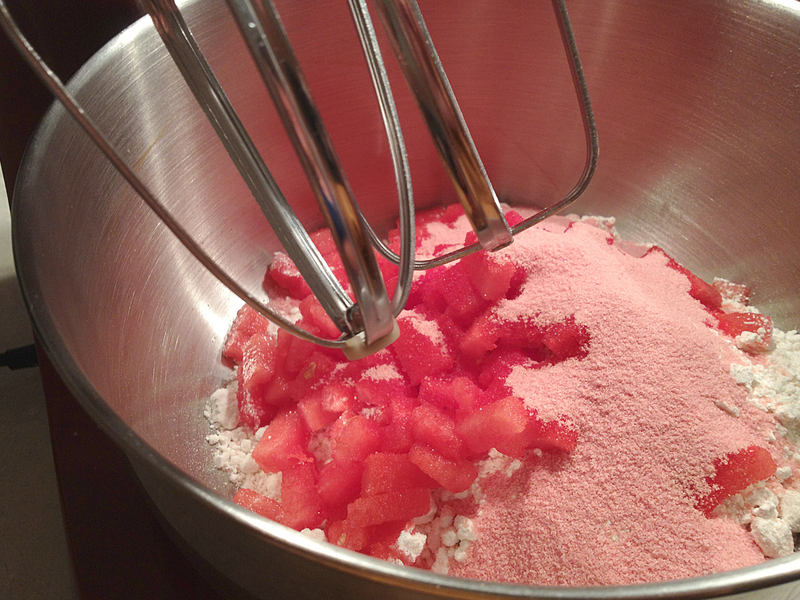 Dump your cake mix in the bowl of an electric mixer, top with 1 tablespoon of flour, the gelatin packet and 1 cup of chopped fresh watermelon. I love the contrasting colors in this bowl! 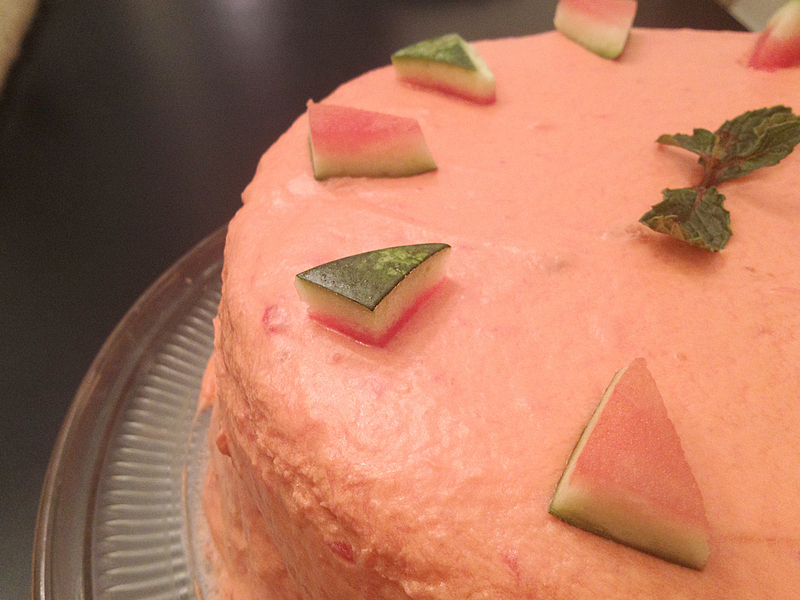 The watermelon turns the batter a beautiful, natural pink. 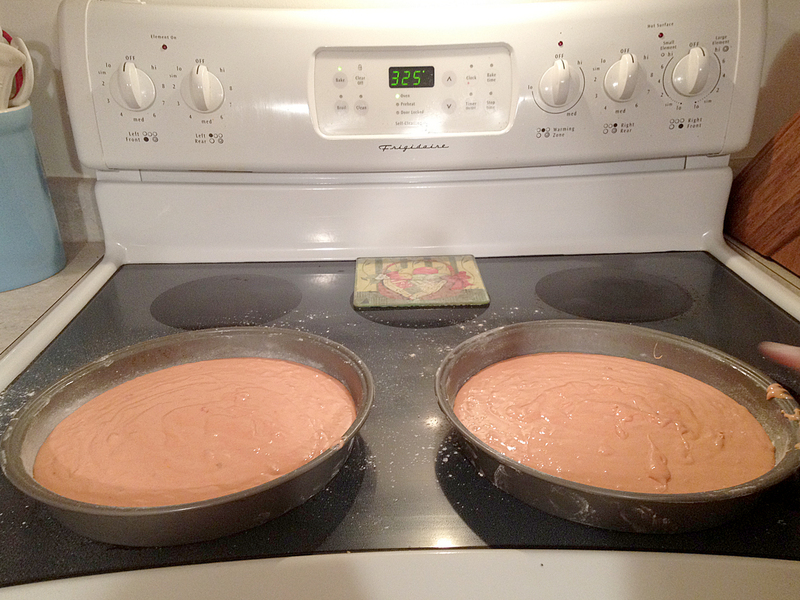 Divide the batter evenly among two 8-inch round cake pans and bake for 30 minutes at 325 degrees. I like to drop my pans on the counter top before popping them in the oven to get rid of any air bubbles. 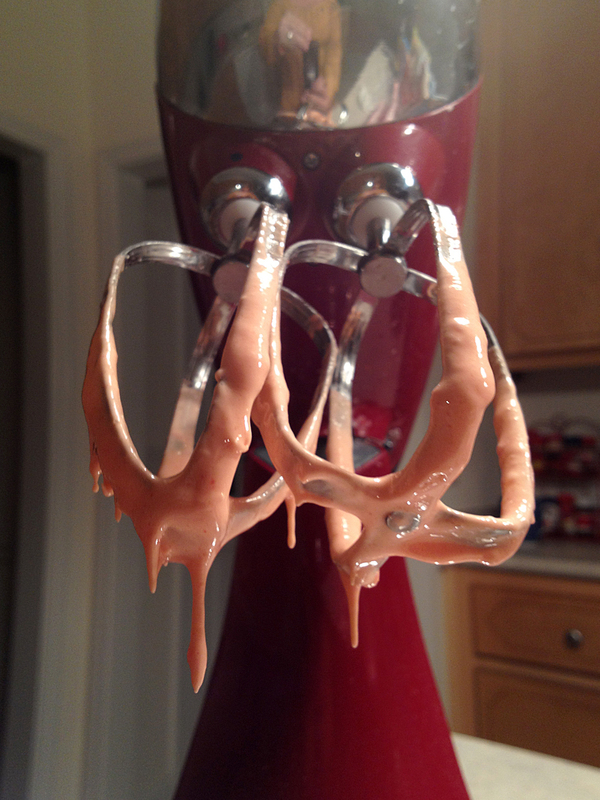 Meanwhile, whip up the frosting. It’s very sweet and achieving the right consistency can be tricky. Here’s what’s in it: 1 16 oz. 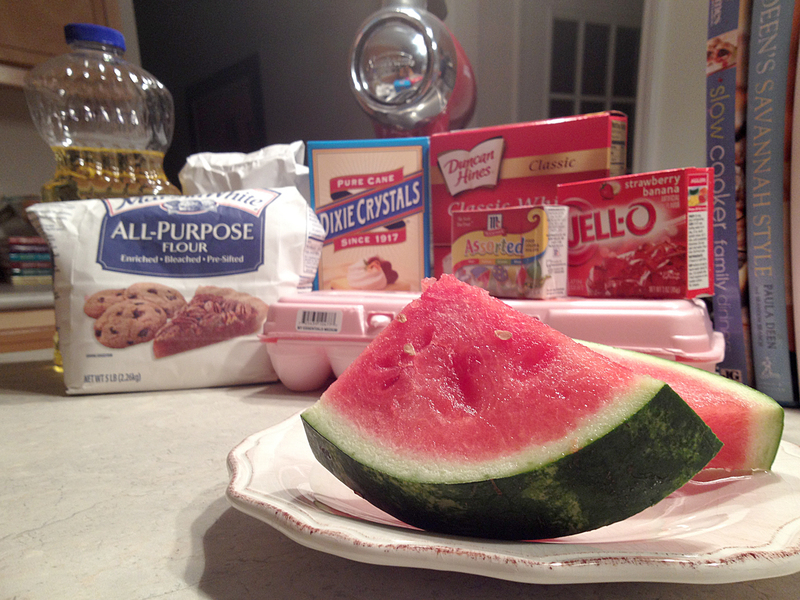 box of confectioners sugar, 1 stick of margarine and 1/2 – 1 cup of chopped watermelon. 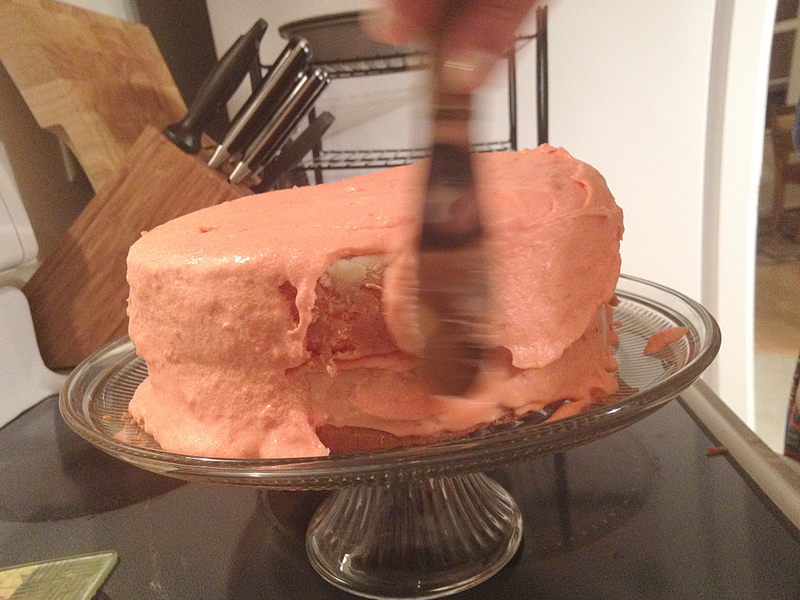 Red food coloring is optional and I chose to add it because without it, the frosting appeared to be the color of peach. 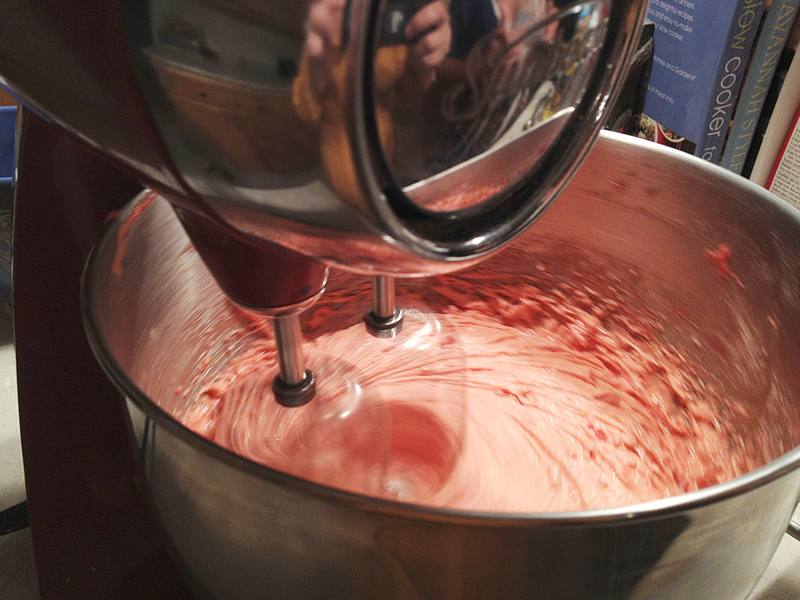 A few drops will turn it pink, the same color as the batter. Remember–too runny? Add more powdered sugar. Too thick? 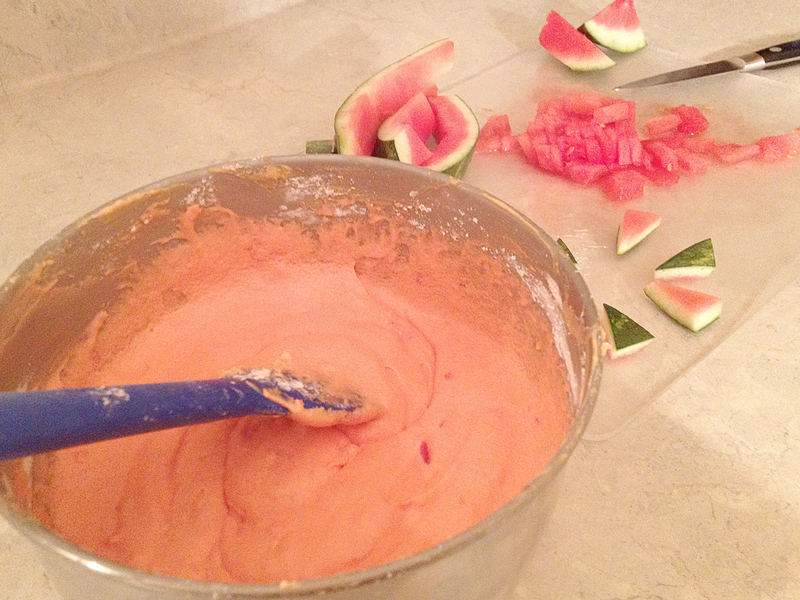 Add more watermelon. 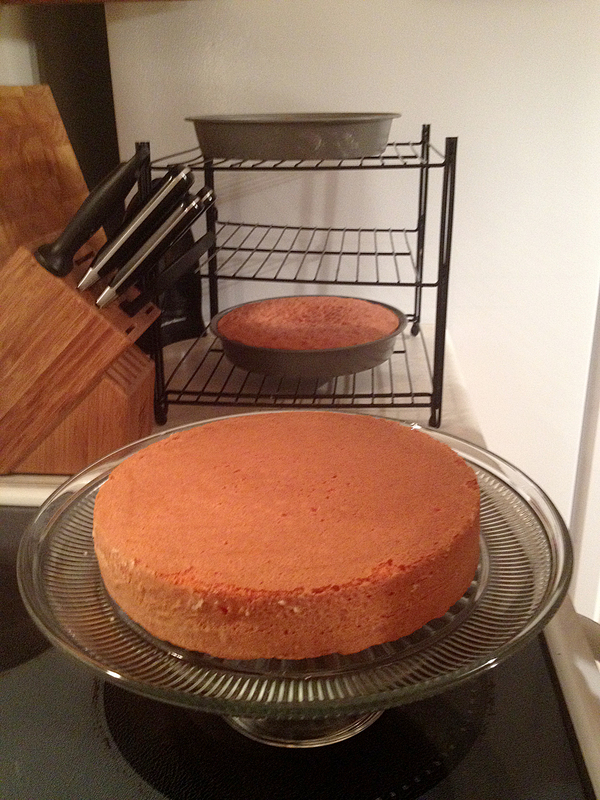 Once the cakes have cooled completely, they are ready to frost. Note: I used Crisco to grease my pans and also dusted them with flour…they released the best I’ve ever seen any cake let go from a pan. THAT’S a beautiful thing. Frosting the cake is a messy job. Use wax paper under your cake to avoid having so much to clean up. My favorite part is always decorating it! 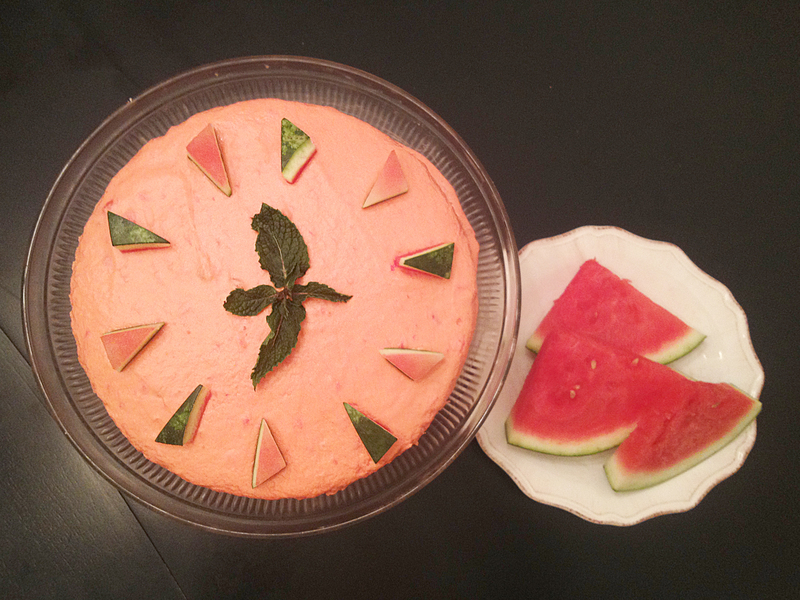 Fresh mint and tiny watermelon wedges did the trick. Ta-da! So fun, so festive. In the video below, watch as I cut the cake and share some ideas on places to take it! If you do bake the cake for a gender reveal party, obviously, you’ll want to change the color of the frosting. Oh my goodness, words can not describe how much I enjoyed working with this recipe. We are cupcake fans here, so I made them as cupcakes and I could not stop eating the batter. I then made the frosting as directed, but I added a mint flavor to it, and used green food coloring and I also put chocolate sprinkles on top. Thank you so much for such a great recipe! I will use this again soon. That’s what it’s all about. How fun! I love the idea of using green food coloring. So glad I could be of inspiration! This recipe is from The Blue Willow Inn cook book. It’s an old Southern restaurant in Social Circle, GA. Thanks for the recipe. I am making this today. I will let you know how it turns out! Thanks Casey!You totally should. It’s delicious. Sista! That looks soooo yummy! Looks so good and so pretty too! Thank you for sharing!